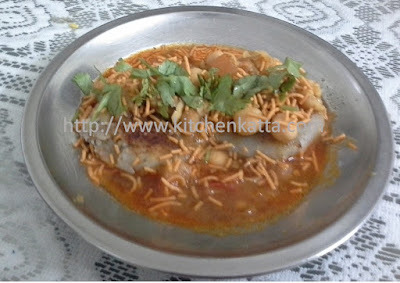 kitchen katta: Raw Banana Tikki with Chole - Perfect snack for cloudy evening!! Raw Banana Tikki with Chole - Perfect snack for cloudy evening!! Come along to experience preparation of Raw Banana Tikki with Chole - the hot chaat!! 1. Boil raw banana and potato together for 2-3 whistles. 2. Once steam escapes, peel the banana and potato and mash together. 3. Add sugar, salt chaat masala and mix well. 4. Divide the mix into equal portions and roll into tikkies (No need of using bread crumbs or corn floor). 5. Heat tava and shallow fry tikkis using butter as needed till golden brown on both sides. Keep aside. 1. 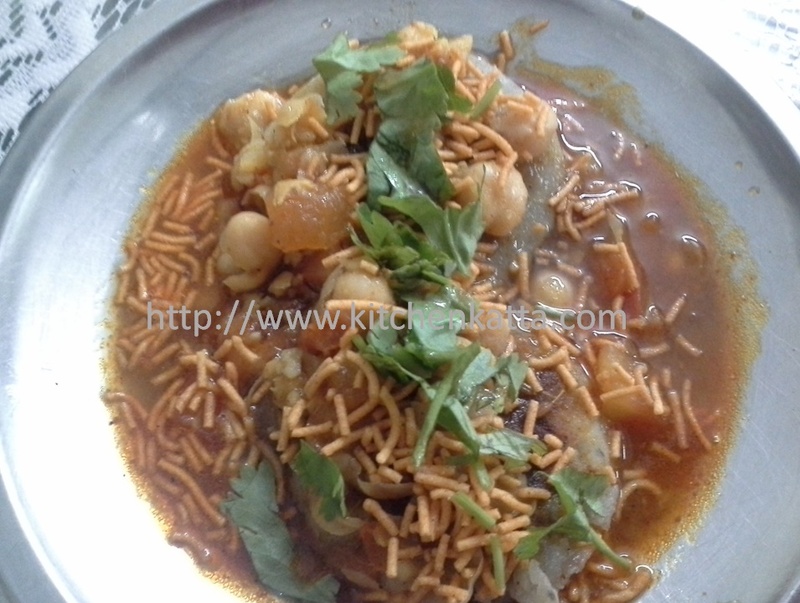 Add little salt and pressure cook soaked chole for 3-4 whistles. 2. Once steam escapes, gently crush chole (Don't mash completely). 3. Heat oil in pan and add cumin seeds. As they crackle add chopped tomato and ginger paste. 4. Cook till tomato softens. Add turmeric powder, red chilli powder, chole masala and salt. Cook till masala are roasted in oil and oil starts releasing. 5. Add cooked and crushed chole and mix well. Add water to adjust consistency. Boil it for few minutes. Turn off the flame. In a deep plate, keep 2 tikkies at time, pour chole on it. Add some sweet tamarind chutney and aloo bhujiya/sev. Garnish with chopped coriander and server the steaming Raw Banana Tikki and Chole chaat! !